This is a case I had with one of our superb internal medicine/emergency medicine residents, Marco Salmen, MD. He wrote it up for this blog, with some help from me. 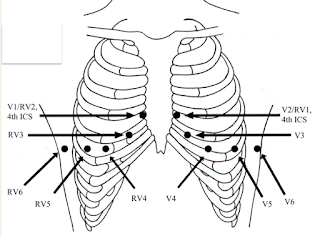 Rhythm: There is a regular, narrow complex bradycardia, with ventricular rate of ~43 bpm. There appear to be P-waves at irregular intervals, but without relationship to the QRS. Thus, there is third degree (complete) AV block. The escape is narrow, thus junctional or from the bundle of HIS. The medics activated the cath lab from prehospital. The patient arrived awake, alert, with only mild chest pain. The BP was 136/91 with SpO2 of 100% and StO2 (tissue oxygenation) of 69% (slightly below lower limits of normal at 70%). She had no past medical history. Inferior STEMI with RV infarction was diagnosed, IV fluids were hung wide open, Aspirin, Ticagrelor and Heparin were given, and a cardiac ultrasound was performed. There is a large, dilated right ventricle with significantly reduced systolic function, with bulging into the left ventricle known as the “D sign”. There is diffuse hypokinesis that appears to spare the RV apex. 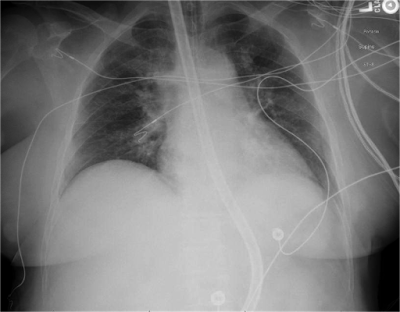 This is known as “McConnell’s sign”, and is seen in both acute PE and RV MI equally. 1 Although not seen well in this view, the left ventricle appears to have mildly reduced systolic function as well. 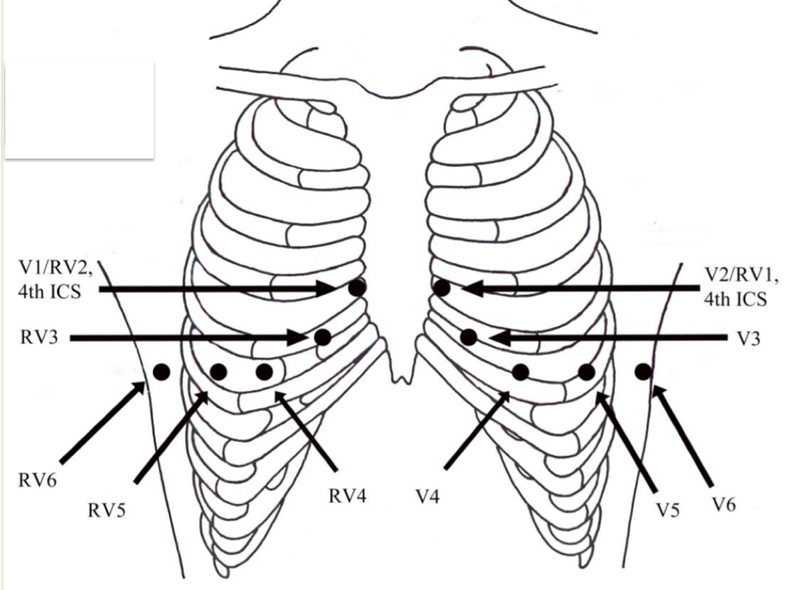 Additionally, there were no B-lines (with RV MI, one may get cardiogenic shock but without pulmonary edema), as the shock is due to right ventricular failure, which does not lead to the elevated pulmonary capillary pressure that causes pulmonary edema. A confirmatory Right Sided EKG was obtained. Increasing ST elevation is seen in Leads VR3 through VR6 confirm Right Ventricular MI. While preparing for catheterization, the patient's BP dropped to 54/25, with StO2 still at 69%. Fluids were continued. 1 mg of atropine was given without effect. Then there was an acute change in mental status with BP 66/53 and congruent with an acute drop in StO2 to 60% (low, indicative of inadequate perfusion). With this cardiogenic shock, she required intubation for airway protection, as well as transient vasopressors (push dose epinephrine), sedation with ketamine, paralysis with atracurium, and transcutaneous cardiac pacing, which improved her heart rate and perfusion. Coronary angiography revealed an acute thrombus with 100% occlusion of the proximal Right Coronary Artery (proximal to the right ventricular marginal branch), successfully stented and reduced. The left coronary arteries were clean. She required approximately 12 hours on a vasopressor infusion and with an intra-aortic balloon pump, but was successfully weaned, extubated, and left the hospital on Day 4. Her formal echocardiogram revealed full right ventricular function, LVEF of ~50%, and small persistent wall motion abnormality. This patient’s first ECG clearly demonstrated STEMI and the need for cath lab activation. The right coronary artery is the most common culprit artery in acute inferior MI, but a lesion in the left circumflex artery (LCx) can produce a similar pattern of ST elevation in inferior leads. Distinguishing an RCA lesion from LCx lesion by early electrocardiogram is often important given the unique consequences of right coronary ischemia, particularly SA node ischemia causing bradycardia and AV nodal ischemia causing AV block, as well as right ventricular MI with dysfunction. Because RV dysfunction can lead to reduced LV filling (pre-load), with resultant hypotension and potentially shock (with greatly increased mortality over isolated LV inferior STEMI)2, it is important for first-line providers to quickly recognize the presence of RV dysfunction in the setting of MI. Clinically significant RV dysfunction occurs likely in only a minority of inferior myocardial infarctions, due in part to its smaller mass, thinner walls, and extensive collateral circulation 3, 4. When RV dysfunction is observed or suspected, nitrate administration must be avoided, and instead, augmentation of pre-load must be given, commonly through IV fluids. In addition to ST elevation in inferior leads, there are several features of the ECG that suggest an RCA lesion and RV ischemia. Commonly referenced standard of ST elevation in Lead III greater than in Lead II suggests an RCA lesion, but is not specific or sensitive for RV infarction. Similarly, ST depression in lead aVL is very sensitive and specific for inferior MI, but non-specific for culprit artery (RCA vs. LCx) or the presence of RV infarct 5. Some series suggest the magnitude of ST depression in aVL can be more specific for RCA occlusion, while the absence of any ST depression in lead I is highly suggestive of a Left Circumflex lesion over a RCA lesion 6, 7. However, claims that ST depression in I is indicative of RV MI are incorrect except to the extent that, by indicating RCA etiology, it makes RVMI possible (circumflex occlusion does NOT cause RV MI). Among precordial leads, ST elevation in lead V1, the furthest right precordial lead which lies directly over the RV free wall, is nearly diagnostic of RV STEMI. Investigators have looked at the ratio of ST depression in Lead V3 compared to ST elevation in Lead II (V3:III ratio), finding that a V3:III ratio of less than 0.5 suggests a proximal RCA occlusion8. ST elevation in Lead V4R is highly sensitive for an RV infarct, as confirmed by multiple studies. Specificity for RV infarction approaches 100% if ST elevation in V4R is greater than any ST elevation in V1-V39. One must remember, however, that a right-sided ECG should be obtained early in suspected inferior MI, as the right-sided ST elevation is transient and most prominent early in the course of infarction. 1. In acute inferior STEMI, on the standard left-sided ECG, STE in Lead V1 predicts RV MI. 2. Early in the course of an MI, findings on right-sided EKG, particularly ST elevation in Lead V4R, can confirm RV infarction. 5. Moderate IV fluid administration can ameliorate the shock and hypotension. 6. Intubation and paralysis lowers the metabolic needs in cardiogenic shock. 6 Birnbaum Y et al. ST segment depression in AVL: a sensitive marker for acute inferior myocardial infarction. Eur Heart Journal, 1993. Vol. 14 (1) 4-7. 8Kosuge M et al. New electrocardiographic criteria for predicting the site of coronary artery occlusion in inferior wall acute myocardial infarction. Am J Cardiol 1998, Vol 82: 1318–22. 3Ondros et al. Right ventricular myocardial infarction: from pathophysiology to diagnosis. Exp Clin Cardiology, 2013. 18 (1): 27-30. 7Turban et al. Diagnostic value of aVL derivation for right ventricular involvement in patients with acute inferior myocardial infarction. Ann Noninvasive Electrocardiology, 2003, Vol.8 (3):185-8. 10. Haupt HM et al. Right Ventricular Infarction: Role of the Moderator Band Artery in Determining Infarct Size. Circulation 1983;67:12168-1272. Thanks for another interesting case. On echo, interestingly, we can see an organized and unsynchronised (faster than ventricules) atrial contraction! Great post, Steve! Since the RCA feeds both the SA and AV nodes, we see two effects here: the 3rd degree AV block which you noted and the loss of the SA nodal pacemaker. The P waves in III and aVF are really low atrial P' waves since they are inverted. Indeed! We verified capture by ultrasound. ive had this discussion with alot of different providers and the general consensus is that nitrates are completely contraindicated with RVMI. i understand that teaching and the rationale but i tend to think that nitro still has its advantages, ie dilating coronary arteries, if you can control the preload with fluid and or pressors. anyone care to comment on that? I would ask: "What is the benefit?" Probably none. Unless there is hypertension or pulmonary edema, neither or which will occur with RV MI. Just go get the artery opened. Did the complete heart block with junctional escape resolve after PCI? Or in other words was there no need for permanent pacemaker? Chest pain in an elderly male. Is this Acute Ischemia? More on LVH.